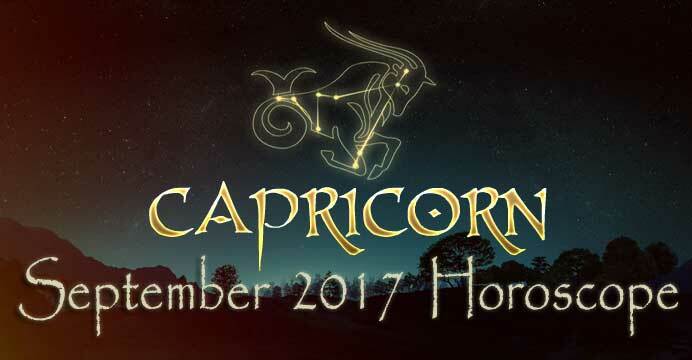 Capricorn September 2017 Horoscope | Capricorn Life - Capricorns Rock! You are in September, a month that always treats you well. September is ruled by Virgo, an earth sign like yours, so by the time you get to September, you often find things start to go your way. The eclipses of last month on August 7 and August 21 brought a strong accent on money management. As you enter September, you seem to have several more financial details to address. All should go well. Additional news about money may reach you on September 3 or September 4 as Mars moves over the critical 29 degrees Leo of the solar eclipse. If you heard nothing about money, keep your antenna up near September 21, plus or minus four days. Your career is showing signs of enormous growth, something that you may have already seen evidence of during the past twelve months. Jupiter, the giver of gifts and luck, has been shining in your tenth house of honors, awards, and achievement since September 2016, making this period your best in a decade for professional progress. Next month, Jupiter will leave your career house when it enters a new sign on October 10. If you feel you’ve not made enough career progress, and there is an influential person you still need to see, then make that call, send that important email, and make that appointment now. VIPs will be open to what you have to say and if a VIP likes your idea, he or she may even be willing to go out on a limb to help you. While you will always have shimmering career aspects come by in the future, with Jupiter in your career house, you have a rare and special protector, and career progress will likely be easier now than ever. Take that first step and you will be encouraged to take more. In astrology, under an aspect like this, Jupiter in the tenth house, which is so special (not to happen until August 2028) you don’t have to actually land your new more prestigious job now, but you do have to plant the first seed to begin the process. That would be the “birth” of your effort, which is under such golden vibrations now. For career progress, put a gold star on Friday, September 15, a day when your fine work will likely bring financial reward and praise for work well done. This glorious day comes due to Venus, the planet governing your solar tenth house of prestigious career advancement, in close talks with financial Jupiter. Other fine days for career include September 9 and September 17-18. Mercury was retrograde last month starting August 12, but will go direct now on September 5, much to your relief. Say goodbye to delays, cancellations, mix-ups, wrong communications, and faulty judgments – yours and those of higher ups. You can now start to buy appliances and electronics, which were not favorable to purchase last month. You can sign contracts and make big announcements, but just be patient to give yourself space from September 5. In that regard, September 12 and 15 would be stellar days to sign papers, and September 17 would be great to go shopping for machines with moving parts or that are electronic. Travel is also forming a very strong theme now, and you will see evidence of this at the full moon, September 5. Neptune will be conjunct that full moon, indicating you will likely want to be near a refreshing body of water, such as a lake or creek near a thick forest, or be at the seaside to breathe in the salty ocean air. This trip, as lovely as it will be, will not entirely satisfy your desire to be in a new environment. If you have not used up all your vacation days this year, wait ’til you see what is coming later in September! It is due to be sensational. A group of planets is gathering in your solar ninth house later this month. Your ninth house rules international travel and relationships, as well as matters related to immigration. This area of the chart also rules media, including publishing and broadcasting projects, and all legal matters and court settlements. These areas will be outstandingly lucky for you now. For the first time in two years, Mars will spend time in this house, spanning September 5 to October 22, and Mars will support you in a big way while there. Mars, the action hero of the zodiac, will be among the first planets to arrive at your solar ninth house form September 5 to October 22. (This is important, because you’ve not had Mars in this area in two years.) Next, Mercury will enter Virgo (September 9 until September 29) and later, Venus will show up, dressed to the nines (September 19 until October 14). The stage is set for an ideal environment for you to do something that relates to a dream you hold passionately in your heart, and that relates to the topics described as part of the ninth house above – international travel and relationships, the media and the courts, immigration matters, and anything having to do with attaining a higher educational degree. All this planetary energy related to the ninth house is great, but until the new moon arrives to package all this energy and make it accessible to you, not much will happen. Happily, the perfect new moon will arrive in Virgo on September 19, and all the little planets will be there to greet the magnificent moon and her partner, the Sun. This new moon will unlock your luck being brought from the five heavenly bodies clustered there. The moves you make quickly, in the ten days following that new moon, will color the six months to come, or much longer, possibly forever. Quick progress is nearly assured. Most Capricorns will use this energy to travel for pleasure overseas or to a paradise island that requires a passport for entry, but you might go for business. Having Mars, Mercury, Venus, the Sun, and new moon – half the solar system – in one small slice of the horoscope shows how dearly you want to learn, grow, and travel, and how much the universe will help you reach those aims. Your inner thermostat is telling you that you need change and new topics to focus your mind – you will have all you crave. Clearly September may become your favorite month of the year. You will see how magically this month will unfold for you, and how supported you will feel in various areas of your life. 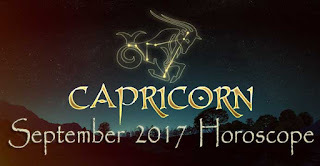 You’ve not seen anything like this in a long while, but now that you have these twinkling stars surrounding you, take full advantage, dear Capricorn. You will welcome September with open arms. It’s a solid month for you and it will continue to get better as you move toward the second half. It’s a month to take a deep breath, travel, and get ready for a busy season. At the start, you don’t have to rush, so slow down, sip your coffee, read the newspaper on your tablet, check your social media account and email, and take a slow entry to the month. Last month Mercury started to retrograde, from August 12, and will continue its backward slide but only until September 5, at which time Mercury will go direct. This will be a big relief, for you will be able to plan with greater certainty. Mercury is the planet of intellect and objectivity, facts and figures, communication, negotiation, contracts, shipping, the mail, technology, software, telecommunications, electronics, and travel. When Mercury retrogrades, we all feel these areas go a little haywire. Keep in mind that Mercury is always his most rebellious at the start and end of his retrograde, what I call the bookend dates. This means you should avoid signing contracts the minute Mercury turns direct on September 5. Wait as many days as you can muster, for doing so will strengthen the future outcome of the agreement. You may be pressured to sign papers at the full moon, September 5, which coincidentally falls on the same day Mercury goes direct. This full moon falls in Pisces and fills your house of contracts and negotiations. Unless you wait beyond the plus or minus five days of any full moon, you will be still pulled into the meaning of that full moon – you need to distance yourself from it. Saturn will be in hard angle to the full moon, suggesting there will be obstacles that will take time to work out once you are in the deal. Pluto in Capricorn will be helpful to you at the full moon September 5, however, as this powerhouse planet of transformation and regeneration is in the perfect place in the sky to protect you. I think the deal is basically sound, but I would prefer you wait. Try not to sign at the full moon because Mercury still will be erratic, and you need him to be stable. While you wait you may see clauses you need to change. Even a verbal agreement is considered an agreement, so keep that in mind. Now I will describe two special days to sign a deal if you can wait. By all means show the paperwork to your lawyer too before signing – that will use up time, and besides you should ALWAYS first show paperwork to your lawyer before you put your signature on contracts. For signing a contract, I’d like you to use Tuesday, September 12 or Friday, September 15, two excellent days. On the first day, Sepember12, Venus will receive supportive rays from Saturn, your ruler and planet of longevity. Any promise or contractual deal that you make on this day is likely to last. The fact that Saturn rules Capricorn indicates that although everyone can use this day for forming a close bond, you will get a double dip of favor from Saturn, for his job is to protect your interests. Use this day for having a successful job interview, client meeting, or presentation. When you need a competitive edge for any business purpose, use September 12. Your second day to circle for signing contracts or scheduling a vital meeting would be Friday, September 15, when Venus will align with good fortune Jupiter. Any agreement you make on this day would mark an important moment in your career, and very possibly become a jewel in your crown. On this day, you can elevate your professional profile to others in your industry and bring attention to the fine work you’ve done. The deal is likely to be a profitable one too – when Jupiter is present, money always follows. Use this day when you need to reach a win-win situation for you and your client. When the topic is money, use September 15. Buying new electronic equipment is never advised during a Mercury retrograde period. Here is what happened to me last month during the retrograde: My iPhone slipped out of my hands and fell into water while I had just started to have a pedicure. It seemed like slow motion as I saw the iPhone slip from my fingers and submerge under the clear water. There was nothing I could do to catch it, and although I tried to get it to work, it was useless. (No, there was no rice available at the salon.) I cannot be without a phone for even a few hours, should any member of my team need me, day or night. I had to buy a new iPhone during the retrograde, but there were decisions to make. I had insurance on it but the insurance only brought down the cost of a new iPhone of the same model I had, an iPhone 6 Plus. I had my heart set on getting the new iPhone 8 when it comes out in September, so I bought the older version as a stopgap, simply to keep communication flowing. I could have bought the iPhone 7 at a much higher price, but that would have been unwise with Mercury retrograde. September 17 would be the ideal time to buy a new computer, smart phone, flat screen TV, kitchen appliance, automobile, or any other machine with moving parts. I like September 17 best for you because Uranus will contact Venus, and Uranus is the planet that rules electronics and software, along with all new inventions. Uranus is also the ruler of your second house of earned income and possessions. Have fun shopping for these types of items on this day, for you are sure to find something you will love. Now let’s backtrack to the top of the month. On September 1 or 2, if you are looking to buy a new house or apartment, you may get a surprise offer that is on-target when Mars in Leo, traveling in your sector of other people’s money, will reach out to Uranus in your house of home, family, and property. If you need to be approved for a mortgage, you are likely to get the green light on this weekend. If you need to sell property – not only land but also furniture – you are likely to find the perfect buyer on this day. It is also possible that you will get help from one of your parents, surprising you with money you might need to fulfill a home-related dream. Now let’s discuss last month’s eclipses, August 7 and August 21, which were highlighting your two financial houses of your horoscope. In particular, the total eclipse of the Sun, August 21, may have brought you welcome financial news about a generous sum of money due to come your way. If you didn’t notice any news happening then, you may hear something now. Specifically, Mars, the action planet, in his swift, forward orbit will reach 29 degrees Leo on September 3 and 4, and this is very significant to you. Astrologers know when either Saturn or Mars reaches the same degree of a recent, previous eclipse, that planet will often open a message of the eclipse. Saturn is currently much too far away to be anywhere near 29 degrees Leo, but here comes action-oriented Mars to fly over those degrees on September 3 or 4. See what happens. In your case, on September 3 or 4, you may get news of money that is about to be given to you. It may be a large commission, bonus, licensing fee, insurance payout, valuable gift, venture capital, mortgage with attractive terms, line of credit, bank loan, scholarship or university financial aid, a court or divorce settlement, prize winning or other windfall. If you already heard news last month, on September 3 or 4, you may get more detail about that matter. There will be one other day this month that also might bring you good financial news, and that will be September 21, plus or minus five days. The reason I say this is that sometimes, in 70 percent of the time, an eclipse will deliver its news right on time, and that would have been August 21. Alternatively, in 10 percent of the time, you will get news of an eclipse one month to the day earlier – that would have been July 21. But in 20 percent of the time, the news will arrive one month to the day later, bringing you to September 21. In all cases, allow a plus or minus five days. This would only happen if you didn’t hear any news near August 21. Now let’s turn to the topic of travel, which I bet you are ready and willing to do soon! Last month you had a lot of financial management to do, so if you saved up your vacation days, you are in luck. You may get a chance to take a short trip at the time of the full moon on September 5, in Pisces, 14 degrees, plus or minus four days. Pisces rules water, so you may want to go to a seashore setting, watch the sunrise, eat lobster rolls for lunch as you watch the surf, and take in the fresh air as you walk along the cool wet sandy shore at sunset. A bigger, more adventurous travel trend is coming up on the new moon, September 19, when the new moon will arrive in Virgo, 27 degrees. All new moons open a portal of energy in which you have two weeks to take action. Virgo is an earth sign that blends perfectly with your Capricorn Sun. Many planets will fill your ninth house at this time, which tells me that you will be highly focused on one of the areas covered by your ninth house after the new moon appears. You may travel to a country overseas to enjoy a sumptuous setting. Or if you will not leave home, for this month you may work with people abroad on an important international project. If you do travel, it looks a little more likely that you will go for business. The ninth house, which will be so lit up for, you also rules academia, so you may be going back to college this month and be busy signing up for courses. You are likely to love them, too – this is the perfect time to be making these decisions now that all these planets are in compatible Virgo and Mercury is normalizing his orbit. If you are not in college or graduate school, you may be brushing up on your specialty, the way accountants do occasionally by taking courses. Your mind will be thirsty for knowledge, so even attending book signings and visiting museums would give you the stimulus you crave. In your daily life, as this influence begins to take hold you will see the potential of projects in broader terms than you would usually do. Your creativity is being stimulated, and original ideas will flow. Immigration matters can now be handled with the expectation that you will see fairly rapid progress in the day and weeks after September 21 in regard to obtaining a green card, visa, citizenship, or passport. If you are a TV or radio producer, director, stage manager, or director of photography on set, or work in publishing as a writer, editor, proofer, or work in marketing, public relations, or social media, this new moon will stimulate new assignments that will be just your cup of tea. If your birthday falls on January 18 or within four days of that date, you will note especially the uplifting effects of new moon of September 21. The same would be true if you have Capricorn rising 27 degrees, or have a natal planet in Capricorn, Virgo, Taurus, Cancer, Scorpio, or Pisces. More good news! Pluto, now orbiting in a very long journey through Capricorn, has been retrograde since April 20 but will go direct at month’s end, September 28. Pluto’s more robust orbit will help you set plans in place and forge courageously ahead on ideas you have to improve your life. Romantically, the time when Venus moves through Virgo will be your very best, from September 19 to October 14. Venus will give you magnetism and make your charm more visible to others. Meanwhile Mars will also tour Virgo, adding to your charisma, from September 5 to October 22. This is fantastic because these two planets are called the cosmic lovers, and when together they set off sparks to help singles find love. The trouble is, most of the time, Venus and Mars are not together, due to their very different orbs. There is also the added requirement of having Venus and Mars in an earth sign, for that way these two can help you most. Now these lovebird planets will be together in earthy Virgo and will move to perfect conjunction next month, October 6. By the end of September, Venus and Mars will be close enough to that conjunction in Virgo for you to feel the glow. Plan a very special romantic night out on Thursday, September 28 or Friday, September 29 when Venus and Mars will be drawing close, and the transiting moon will be in Capricorn. If you are single, go with friends and see what happens. Attached? Choose one of these nights to splurge on a great dinner for two, in a restaurant with candlelight and flowers and known to offer fine food. Have fun shopping for new things for the coming season too, for Venus and Mars will see to it that you look stunning and will turn heads when you step out. It is a special time for men or women Capricorns to find ways look their best. As you see, dear Capricorn, this month is for you.